The Internet came into the Philippines on March 29, 1994 and its 20th anniversary celebration made me recall my affair with computers and the World Wide Web. I have said it many times that as a senior citizen, one bragging right that I have is that I belong to around 5% of my generation who actively use the technology and wonders of the computer in its many current forms. I am using a Windows laptop installed with Mac OS X in doing my blogs and a cheapy but modded quad-core Android tablet for my social media activities. I also have a dual-SIM smartphone that I myself rooted in order to get rid of bloatware and free a few more space for the apps that I need. I had my first personal experience to use a computer in 1981 when I was sent to Texas USA for a technical training on Step-By-Step Auto-Telephony. It was a TRS 80 Radio Shack computer followed by Commodore 64 then Apple III and IBM 8088 Personal Computer that I got to use when I worked in Hong Kong in mid-1980s. It was in 1988 that I asked a programmer to make an inventory control program using DBase III ported in an 8088 IBM PC. For my family’s use, I bought a second-hand IBM Personal Computer with 8088 processor (see image) sometime in 1993. Our oldest son upgraded the unit with a 20-MB hard disk drive and with it they self-studied and became proficient with DOS programming. At a young age of 10, our youngest child did an application that I used to keep track of orders in the company that I was working for at that time. It was also this time that I learned WordStar for word processing and Lotus 123 for spreadsheet calculations. 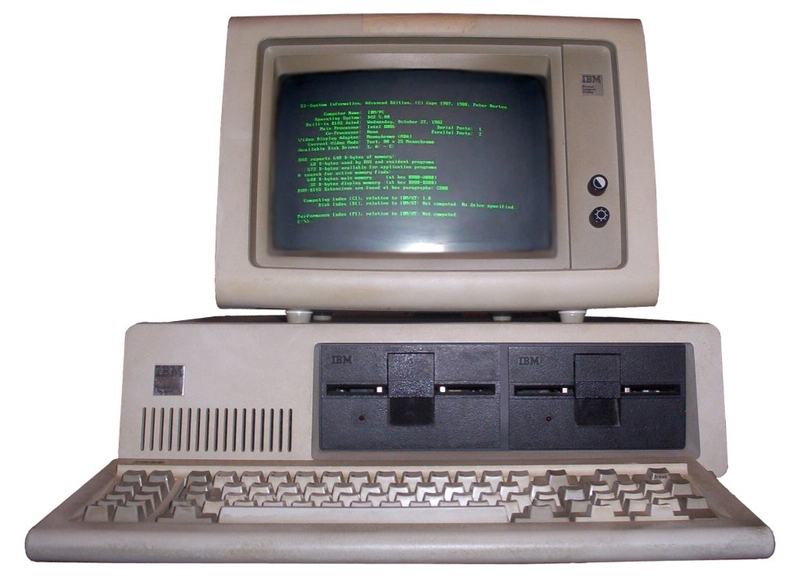 Not long after, I bought a brand-new IBM Cobalt 486 PC with 75-MHz processor in 1994 and I remember it was this unit that our children used to access the Internet to become BBS (Bulletin Board System) regulars. We used a USRobotics 56K/33.6K External Modem to access the Internet with 28.8Kbps dial-up connection using prepaid cards that cost PhP30.00 per hour. It was also then that I started using emails for my communications which was provided by Edsamail for which I had to pay for the service on a monthly basis for an amount that skips my mind now. If I remember it right, the free Yahoo! Mail came in 1997 while Gmail was in 2004 so I did pay Edsamail for my email service for almost 3 years. My real serious affair with computers and the Internet started in year 2000 when my oldest son convinced me to start an internet cafe (i-cafe) business in the City of Manila. We ran an 8-station i-cafe for more than 2 years using prepaid service to access the web. In 2002, we moved to Catarman, Northern Samar and used a 400Kbps Satellite Internet service for a 12-station i-cafe in a state university campus. I-cafe business was really good then, our earnings supported the college education of our younger children. In 2004, we moved back to Metro-Manila and using DSL Internet connection, the business grew to a 55-station i-cafe in Marikina City. We were never into gaming in our i-cafe business. We cater to high school and college students for their educational needs by providing them with Internet access at PhP20.00 per hour plus typing, scanning and printing services at affordable costs. We closed our i-cafe business in 2007 when the city’s Pamantasan ng Lungsod ng Marikina (PLMar) was relocated in a place where we could not find a space to rent. My affair with computers and the Internet did not end with the closure of our i-cafe business. I went blogging in 2009 as part of my advocacy for the i-cafe industry in the Philippines and continue to blog about issues and my actual experiences in the life of a retired senior citizen. These days, I am online most of my waking hours and having fun sharing my thoughts in social media. You, how is your affair with technology? Can you share it with us? Sana lang po bilis bilisan naman ang internet connection dito, kahit naka premium plans ay naku mapapaiyak ka sa bagal, heavy user tayo and greedy business corporations think like we are in dinosaur age.